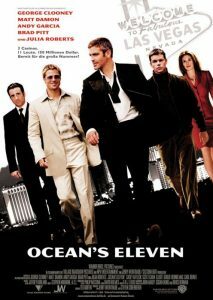 Ocean’s Eleven is a 2001 American romantic crime thriller directed by Steven Soderbergh and the screenplay written by Ted Griffin. Ocean’s Eleven stars George Clooney, Brad Pitt, Matt Damon, Julia Roberts, Andy Garcia, Don Cheadle, Bernie Mac, Scott Caan, Casey Affleck, Carl Reiner, Elliott Gould, Eddie Jemison and Shaobo Qin. Danny Ocean (George Clooney) with the assistance of his associate Rusty Ryan (Brad Pitt), assemble an eleven member team to score the biggest heist in history. Their target? The Bellagio, The Mirage and the MGM Grand Casinos in Las Vegas. All casino’s owned by Terry Benedict (Andy Garcia). It will not be easy but they plan to get in secretly and out with $150 million to split evenly.